Leakage is the major factor for unaccounted losses in every pipe network around the world (oil, gas, or water). In most cases, the deleterious effects associated with the occurrence of leaks may present serious economical and health problems. Therefore, leaks must be quickly detected, located, and repaired. Unfortunately, most state-of-the-art leak detection systems have limited applicability, are neither reliable nor robust, while others depend on the user experience. In this project we work towards a new in-pipe leak detection system. Our proposed robotic system is able to detect leaks in pipes in a reliable and autonomous fashion. The idea is that the robot is inserted into the network via special insertion points. The robotic system inspects the network and sends signals wirelessly via relay stations to a computer/base station. Leak signals stand out clearly on the occurrence of leaks, eliminating the need for the user experience. The latter is achieved via a detector that is based on identifying a clear pressure gradient in the vicinity of leaks. Detection is based on identifying the existence of a localized pressure gradient (∂p/∂r , where r stands for the radial coordinate of the pipe). This pressure gradient appears always in pressurized pipes in the vicinity of leaks and is independent of the pipe size and/or pipe material. Moreover, the pressure gradient exists in different media inside pipes, which makes the detection method widely applicable (gas, oil, water pipes, etc.). 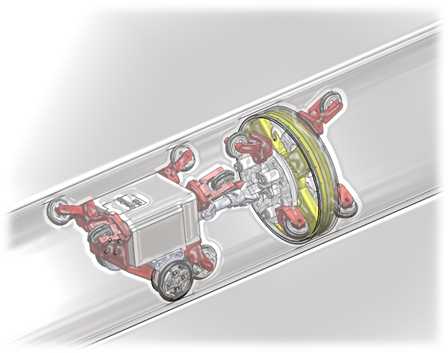 Moreover, the proposed detector can sense leaks at any angle around the circumference of the pipe with only two sensors.